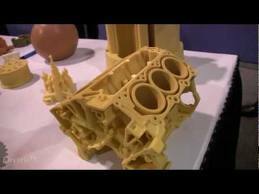 What Is 3D Printing Any Ways? What if there was a technological device that, when connected to your computer, could actually print out solid objects? If it sounds like something out of Star Trek – guess again! Although we’re not quite to the level of “Beam me up, Scottie!”, 3D printing is still very much a reality, and has the potential to completely re-shape the world as we know it. If you haven’t ever heard of 3D printing, it’s not surprising. Although the technology has been utilized within industrial settings for over 30 years, 3D printers for consumers and small businesses are just now beginning to take off. In a nutshell, 3D printing is an additive manufacturing technique which is used to build up objects in multiple layers. After one layer is printed and created, it is hardened, another layer is added, and so-forth. The process can take several hours to complete, however, the end result is a tangible 3D object. The most common use of this technology is to create rapid prototypes within the industrial field. These prototypes prove to be very useful for architects, automakers, etc. It is possible, though, for industrial 3D printers to create final products – especially in the case of metal objects. Traditionally, machining of metal componets would start with a piece of metal larger than the finished part. 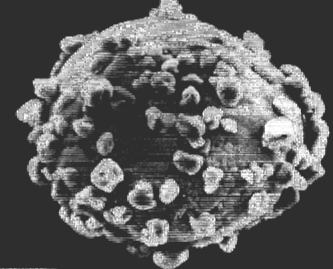 From this material metal would be removed on all surface’s and interiors such as cavity’s and holes. Imagine using a 3D printer that would lay down your part one layer at a time with all holes, cavities, contours and surfaces finished! The savings in time and materials that can be realized are tremendous. 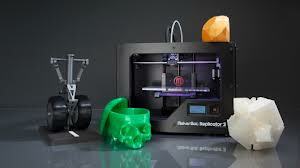 Consumer-oriented 3D printers, on the other hand, are typically used for hobbies and personal interests. This type of 3D printing is more for enjoyment in seeing what you can do with this new technology. Even a small desk top 3D printer will set you back over $2,000 but if you want to be the first guy on the block to have a 3D printer and you love to tinker with new stuff the price could be worth it to you. What methods are used in 3D printing? Fused deposition modeling – This is the most common method used in 3D printing. Fused deposition modeling (FDM) utilizes a spool of either plastic or metal wire which is melted and placed by the nozzle of the printer. The material will quickly harden before the next layer is added. Inkjet printing – These models are the most similar to the devices that are already used within homes and offices for standard 2D printing. By using special inks (such as resins and binders), an inkjet 3D printer will build up an object through layering. These printers are the only one of their kind that allow for custom coloring. Selective laser sintering – Sintering is a process that is used to create solid objects from powders. With selective laser sintering (SLS), this powder may be in the form of metal, plastic, ceramic, or glass. SLS makes use of a pulsed laser to “draw” a cross-section of the object to be printed. Once the powder fuses, another layer is formed on top. This method is typically used within the industrial sector, as it requires the usage of a powerful laser. Digital light processing – Most often referred to as DLP, this method of printing converts a vat of polymer into a strong solid via exposure to light. By utilizing this method, a very high accuracy and resolution can be achieved. Like SLS, this is generally a method utilized in the industrial field. It will take some time, but the goal for 3D printing is to change the way the world does business and interacts. One day, the technology may allow us to craft just about anything – from tools to toys and everything in-between. Perhaps in the future we will be able to fax tangible objects, eliminating the need for postal services mail packages. Only time will tell what all this technology can achieve for us, but the future may be closer than you think! So what is toner? We get asked that all the time. First off let’s make sure we are all talking about the right kind of toner, what we are not talking about is the cosmetic toner, you know that lotion or wash designed to cleanse the skin and shrink the appearance of pores. No, the toner we are talking about is what’s inside the toner cartridge you buy for your printer, it’s the actual medium that lets your printer lay down the images and text that you see come out on your paper. The toner itself is an electrically-charged powder with two main ingredients: Pigment and Plastic. The role of the pigment is to provide the coloring, black, cyan, magenta or yellow that produces the text and images on the paper. This pigment is blended into plastic particles so that it will melt when it passes through the fuser which gets heated to a high enough temperature to melt these plastic particles.This quality gives toner powder a number of advantages over liquid ink. Using heat to melt the toner onto the medium causes it to firmly bind to almost any type of paper which means the text won’t smudge or bleed easily which is sometimes the case with liquid inks used in ink jet printers. This is toner at it’s most basic level which should suffice for this article. Needless to say there is much more in depth explanations that go into the chemical composition and scientific research of toner but that is not the scope of this post, we just want to give a brief overview of what toner powder is and how it works in the printer you use every day. Each manufacturer spends millions of dollars on R&D and testing in an attempt to make their toner the best on the market. Toner product and the materials that make up the toner is an ever evolving industry. Consumers always want more, for example when toner was first introduced into the market there was only black. Now due to demand we have color laser printers, each toner color had to be invented and researched to produce the desired results. Customers wanted faster print times, that meant the toner had to be changed so it could melt on the paper at faster and faster speeds. So, how does this toner powder get onto the paper? 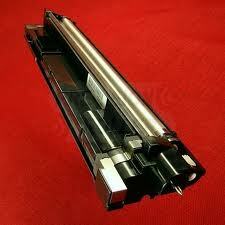 Well the toner is usally held in what we call the toner hopper which is inside the toner cartridge that you buy. The printer gathers the toner from the hopper with what is called the developer unit. The developer is actually a collection of small, negatively charged magnetic beads. These beads are attached to a rotating metal roller, which moves them throughout the toner in the toner hopper. 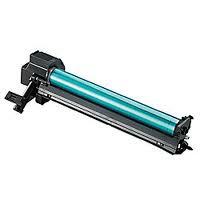 The drum then moves over the paper, which has an even stronger charge and so grabs the toner. 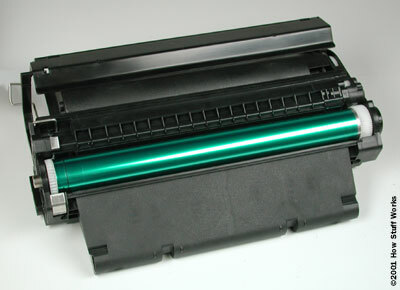 After collecting the toner, the paper is immediately discharged by the detac corona wire. At this point, the only thing keeping the toner on the page is gravity, if you were to blow on the page at this point, you would completely lose the image as the toner would simply blow away. The page must pass through the fuser to affix the toner. The fuser rollers are heated by internal quartz tube lamps, so the plastic in the toner melts as it passes through. Here’s a simplified schematic of the major parts of a laser printer showing the toner hopper, corona wire, fuser, drum assembly and developer roller. When the paper is grabed from the paper tray it passes through the various parts of the printer at a high rate of speed. This is evident from watching how long it takes from the time you hit print to the time your page comes out complete with text and images. If you pick the page up as soon as it comes out of the printer you can still feel the heat form the fuser that melted the toner onto the paper. So what is the main advantage of a laser printer Vs a ink jet printer? Speed, precision and economy. A laser can move very quickly, it can print with much greater speed than an ink jet. Laser printers do tend to cost more than ink jet printers but that is offset by the fact that it doesn’t cost as much to keep them running. Toner powder last a long time and still be usable, unlike ink jets that can dry up if you don’t use them. If your looking to print high quality photo’s better to get a high end ink jet, if your looking to print a lot of text documents or even color presentations for office use, get a laser printer. Let us know what you think of the post, we love to hear from our readers so we can improve and write blogs that our readers want us to write.